Sacramento County Notary, Placer County, Yolo County. Sacramento Notary Public signing agent, covering Sacramento, Placer and Yolo counties in California. National Notary Association Certified Signing Agent. Apostille service information | Also speaks Spanish and Italian. --- Servicio de Apostilla en California. Legalize sus documentos para usar en Mexico, Colombia, y otros paises latino americanos, Europa, Asia. Una vez notariados y/o apostillados se mandan a traves de Fedex a su consulado, embajada, direccion en Estados Unidos o al exterior_cualquier pais. Una Apostilla es una certificacion(pagina que lleva un sello del gobierno) que va engrapada a sus documentos (carta de poder, acta de nacimiento, certificado de defuncion, matrimonio, divorcio, nacimiento, o cualquier documento notariado/notarizado por un Notary Public comisionado por el estado de California, Secretaria del Estado/California Secretary of State) y es reconocida por cualquier departamento, agencia, oficina gubernamental de los paises miembros de la convencion de la Haya. Traducimos espanol ingles, certificamos, notariamos, y apostillamos. NOTARY PUBLIC SERVICE. No soy abogado/licenciado y no puedo ofrecer asesoria legal de ningun tipo. eNotary, electronic notarizations: e-notary same day service in Sacramento County, Yolo, Placer, El Dorado, Yuba counties. Digital signatures and seal. You will receive back the notarized docs by secure email the same day. Notarize your documents electronically. If are in any country outside USA and need a document notarized in Sacramento area, we can notarize, legalize with an Apostille and send you back the documents electronically the same day. An apostille or an authentication is a document that certifies the authenticity of the signature, seal and position of the official who has executed, issued or certified a copy of a public document. It allows a public document issued in one country to be recognized as valid in another country. Apostilles and authentications are often needed in adoptions, extraditions and certain business transactions. An apostille is a certification form set out in a treaty called The Hague Convention Abolishing the Requirement of Legalization for Foreign Public Documents (1961). 4/5/19 Birth certificate translated, apostille for Colombia. 4/10/19 Death Certificate certified translation, notarization, apostille for Mexico. March 1, 2019 English to Spanish translation certification notarization of Death certificate, Apostille to Chile. Feb 27, 2019 Translation Birth Certificate and Amendment for Mexico. Notarization of loan packages. Safe Signings, Fidelity National Title, Stewart Title. Apostille - Apostilla. Divorce decree for Mexico. Birth certificate apostille for Uruguay. 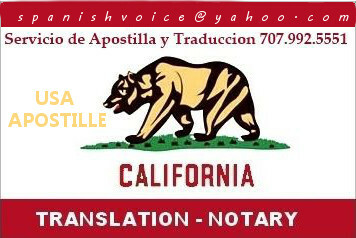 Notarization in Los Angeles, then get an apostille for the same Power of Attorney and ship it to Madrid, Spain. Usted puede hacer una cita para notarizar cualquier documento: Carta de poder, autorizacion de viaje para menores, o cualquier documento que usted quiera redactar o apostillar(acta de nacimiento, defuncion, matrimonio firmada por el oficial del condado, County Clerk). Mandar correo electronico y recibira un estimado: Tiempo y costo del proyecto. Tambien puede llamar de lunes a domingo: 707-992-5551. Passed both NNA NSA Certification Exam and Background Screening. Background Screening completed within past 12 months. View Original This profile was last updated on 4/11/2019.